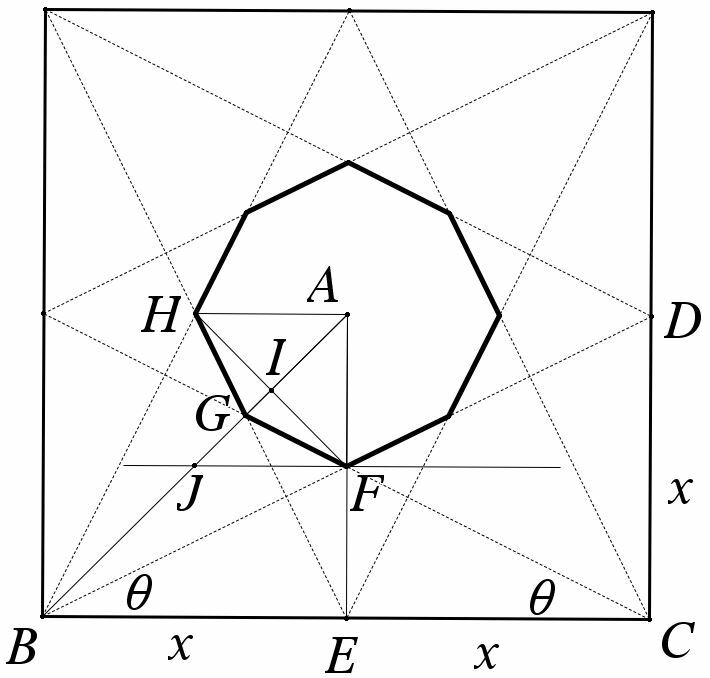 My last post detailed my much-too-long trigonometric proof of why the octagon formed by connecting the midpoints and vertices of the edges of a square into an 8-pointed star is always 1/6 of the area of the original square. My proof used trigonometry, and responses to the post on Twitter and on my ‘blog showed many cool variations. Dave Radcliffe thought it would be cool to have a compilation of all of the different approaches. I offer that here in the order they were shared with me. Method 1: My use of trigonometry in a square. See my original post. Method 2: Using medians in a rectangle from Tatiana Yudovina, a colleague at Hawken School. Area(octagon) = 4 blue triangles – 2 red deltas.. 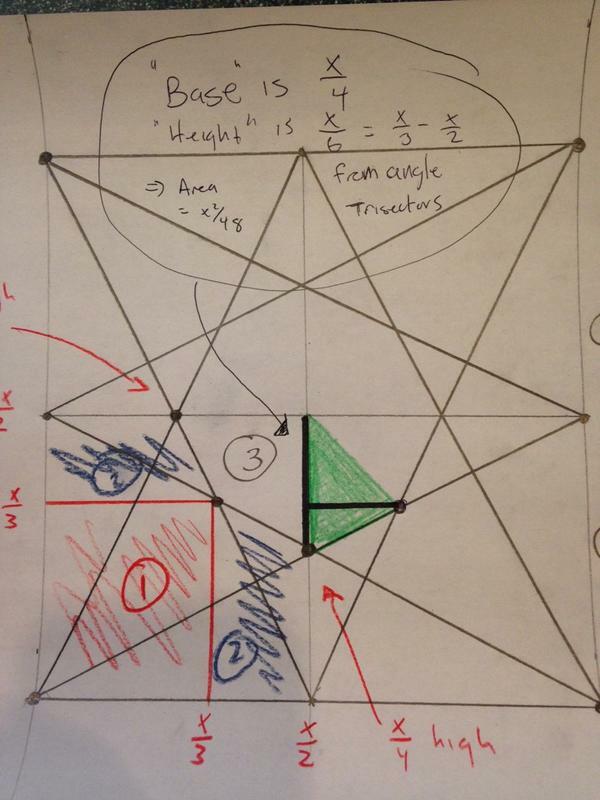 Method 3: Using differences in triangle areas in a square (but easily extended to rectangles). from @Five_Triangles (‘blog here). Method 4: Very clever shorter solution using triangle area similarity in a square also from @Five_Triangles (‘blog here). Method 5: Great option Using dilated kites. from Dave Radcliffe posting as @daveinstpaul. Full pdf and proof here. Method 6: Use fact that triangle medians trisect each other from Mike Lawler posting as @mikeandallie. Method 7: Use a coordinate proof on a specific square from Steve Ingrassia, a colleague at Hawken School. Not a quick proof like some of the geometric solutions, but it’s definitely different than the others. If students know the formula for finding the area of any polygon using its coordinates, then they can prove this result very simply with nothing more than simple algebra 1 techniques. No trig is required. Use a 2×2 square situated with vertices at (0,0), (0,2), (2,2), and (2,0). 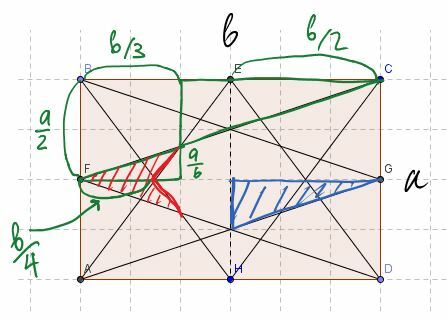 Construct segments connecting each vertex with the midpoints of the sides of the square, and find the equations of the associated lines. 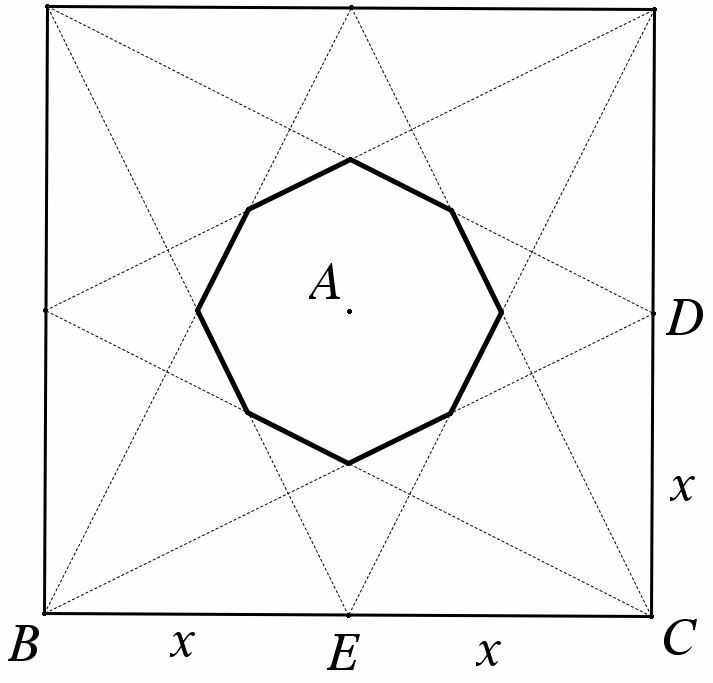 Since the area of the original square was 4, the area of the octagon is exactly 1/6th of the area of the square. Thanks, everyone, for your contributions. Following is a really fun problem Tom Reardon showed my department last May as he led us through some TI-Nspire CAS training. Following the introduction of the problem, I offer a mea culpa, a proof, and an extension. Take any square and construct midpoints on all four sides. 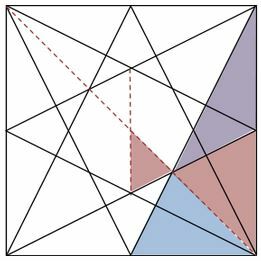 Connect the four midpoints and four vertices to create a continuous 8-pointed star as shown below. The interior of the star is an octagon. Construct this yourself using your choice of dynamic geometry software and vary the size of the square. Compare the areas of the external square and the internal octagon. You should find that the area of the original square is always 6 times the area of the octagon. I thought that was pretty cool. Then I started to play. Using my Nspire, I measured the sides of the octagon and found it to be equilateral. As an extension of Tom’s original problem statement, I wondered if the constant square:octagon ratio occurred in any other quadrilaterals. I found the external quadrilateral was also six times the area of the internal octagon for parallelograms, but not for any more general quadrilaterals. Tapping my understanding of the quadrilateral hierarchy, that means the property also holds for rectangles and rhombi. Math teachers always warn students to never, ever assume what they haven’t proven. Unfortunately, my initial exploration of this problem was significantly hampered by just such an assumption. I obviously know better (and was reminded afterwards that Tom actually had told us that the octagon was not equiangular–but like many students, I hadn’t listened). After creating the original octagon, measuring its sides and finding them all equivalent, I errantly assumed the octagon was regular. That isn’t true. That false assumption created flaws in my proof and generalizations. I discovered my error when none of my proof attempts worked out, and I eventually threw everything out and started over. I knew better than to assume. But I persevered, discovered my error through back-tracking, and eventually overcame. That’s what I really hope my students learn. Goal: Prove that the area of the original square is always 6 times the area of the internal octagon. Assume the side length of a given square is , making its area . The octagon’s area obviously is more complicated. 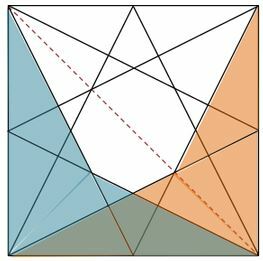 While it is not regular, the square’s symmetry guarantees that it can be decomposed into four congruent kites in two different ways. Kite AFGH below is one such kite. 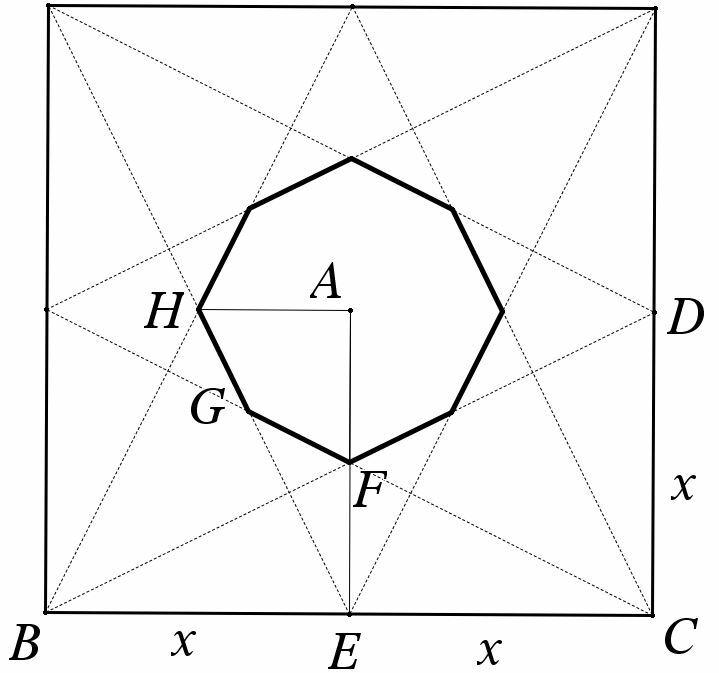 Therefore, the area of the octagon is 4 times the area of AFGH. 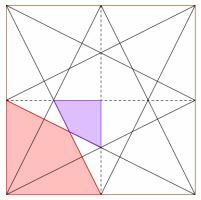 One way to express the area of any kite is , where and are the kite’s diagonals. If I can determine the lengths of and , then I will know the area of AFGH and thereby the ratio of the area of the square to the area of the octagon. The diagonals of every kite are perpendicular, and the diagonal between a kite’s vertices connecting its non-congruent sides is bisected by the kite’s other diagonal. 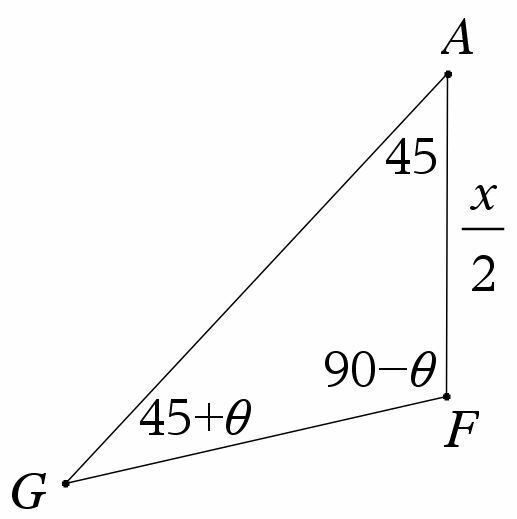 In terms of AFGH, that means is the perpendicular bisector of . The square and octagon are concentric at point A, and point E is the midpoint of , so is isosceles with vertex A, and is the perpendicular bisector of . That makes right triangles . Because , similarity gives . I know one side of the kite. Let point I be the intersection of the diagonals of AFGH. is right isosceles, so is, too, with degrees. With , the Pythagorean Theorem gives . Point I is the midpoint of , so . One kite diagonal is accomplished. Construct . Assuming degree angle measures, if , then and . Knowing two angles of gives the third: . From right , I also know and . Therefore, , and the kite’s second diagonal is now known. This was so nice, I reasoned that it couldn’t be an isolated result. I have extended and proved that the result is true for other modulo-3 stars like the 8-pointed star in the square for any n-gon. I’ll share that very soon in another post. I proved the result above, but I wonder if it can be done without resorting to trigonometric identities. Everything else is simple geometry. I also wonder if there are other more elegant approaches. Finally, I assume there are other constant ratios for other modulo stars inside larger n-gons, but I haven’t explored that idea. Anyone?